Putting the Culture Back in Agriculture – A REAL Eye Opener Folks!!!!!!! “At one point ‘agriculture’ was about the culture of food. Losing that culture, in favor of an American cultural monocrop, joined with an agricultural monocrop, puts us in a perilous state…” says food and Native activist Winona LaDuke. Her lament is an agribusiness executive’s dream. The CEO of the H.J. Heinz Company said, “Once television is there, people, whatever shade, culture, or origin, want roughly the same things.” The same things are based on the same technology, same media sources, same A family on the Navajo Nation in the Four Corners area of the Southwest makes kneel down bread, a traditional food made with blue corn. (Photo: Brett Ramney)global economy, and same food. Together with the loss of cultural diversity, the growth of industrial agriculture has led to an enormous depletion in biodiversity. Throughout history, humans have cultivated about 7,000 species of plants. In the last century, three-quarters of the genetic diversity of agricultural crops have been lost. Thirty crops now provide 95% of our food needs, with rice, wheat, maize, and potato alone providing 60%. Eighty-five percent of the apple varieties that once existed in the US have been lost. Vast fields of genetically identical crops are much more susceptible to pests, necessitating increased pesticide use. The lack of diversity also endangers the food supply, as an influx of pests or disease can wipe out enormous quantities of crops in one fell swoop. Native peoples’ efforts to protect their crop varieties and agricultural heritage in the US go back 500 years to when the Spanish conquistadors arrived. Today, Native communities throughout the US are reclaiming and reviving land, water, seeds, and traditional food and farming practices, thereby putting the culture back in agriculture and agriculture back in local hands. Another revival effort involves buffalo herds. In the 1800s, European-American settlers drove wild buffalo close to extinction, decimating a source of survival for many Native communities. Just one example of the resurgence is the Lakota Buffalo Caretakers Cooperative, a cooperative of small-family buffalo caretakers, on Pine Ridge Reservation in South Dakota. The cooperative sees its work as threefold, to “restore the buffalo, restore the native ecology on Pine Ridge, and help renew the sacred connection between the Lakota people and the buffalo nation.” At the national level, the Inter-Tribal Bison Cooperative is a network of 56 tribal bison programs from around the country with a collective herd of over 15,000. In New Mexico, Native communities are organizing a wealth of initiatives. Around the state, they have started educational and production farms, youth-elder farming exchanges, buffalo revitalization programs, seed-saving initiatives, herb-based diabetes treatment programs, a credit union that invests in green and sustainable projects, and more. Schools like the Southwestern Indian Polytechnic Institute, the Institute of American Indian Arts, and the Santa Fe Indian School – along with grammar schools, high schools, and non-profit programs – have developed agricultural education programs. The Traditional Native American Farmers’ Association helps farmers get back onto the land, hosts workshops on seed saving and agricultural techniques, and has a youth program. The farm provides fresh foods to the senior center, sells at the farmers’ markets, and trains residents to begin farming themselves. The farm also grows medicinal herbs to treat HIV, diabetes, and cancer, and makes biofertilizer from plants. The preschoolers at the Head Start program garden; grammar school students are beginning to, as well. People from across the nation come to Tesuque Natural Farms to study agricultural production and to take workshops on pruning, beekeeping, poultry, soil fertility, composting, and other topics. Soon the farm hopes to create a research and education center, where people can come for three to six months. 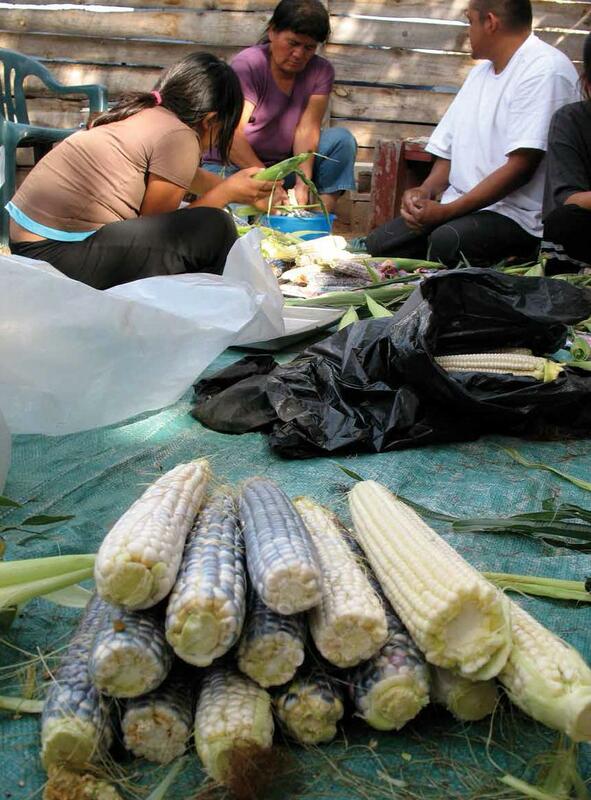 Nayeli Guzman, a Mexica woman who worked at the farm, said, “What we’re doing is very simple. These ideas are not an alternative for us, they’re just a way of life… We need to all work together as land-based people. Download the Harvesting Justice pdf here, and find action items, resources, and a popular education curriculum on the Harvesting Justice website. Harvesting Justice was created for the US Food Sovereignty Alliance, check out their work here. Tory Field is Research and Education Coordinator for Other Worlds. Tory is an organizer living in Massachusetts. She worked for many years as a community organizer with Arise for Social Justice, a multi-issue community justice organization in Springfield, MA. where she now serves on the Board of Directors. Beverly Bell is the founder of Other Worlds and more than a dozen international organizations and networks, Beverly is also an Associate Fellow at the Institute for Policy Studies. Beverly has worked for more than three decades as an organizer, advocate, and writer in collaboration with social movements in Latin America, the Caribbean, Africa, and the U.S. She is the author of the book Walking on Fire: Haitian Women’s Stories of Survival and Resistance.